May, 2014 – We left the pristine alpine beauty of Lamoille Canyon outside Elko, Nevada, and promptly embarked on a 500 mile journey north and west to Oregon across some of the most remote and desolate landscapes we have ever seen. Getting off the interstate (I-80) at Winnemucca, we knew we were entering less charted territory when we noticed that the town’s spelling was “Winnemocca” on the statewide map of Nevada in our Delorme Atlas but was “Winnemucca” on the close-up map. 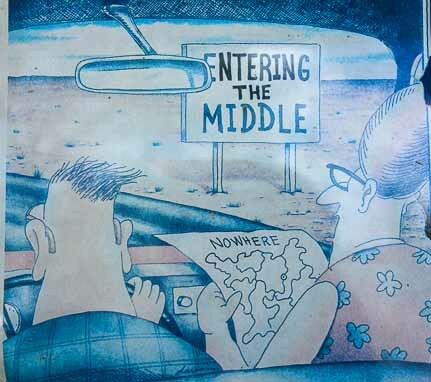 We wanted to get gas and had seen signs on the interstate for big travel centers in Winnemucca but we never found them. 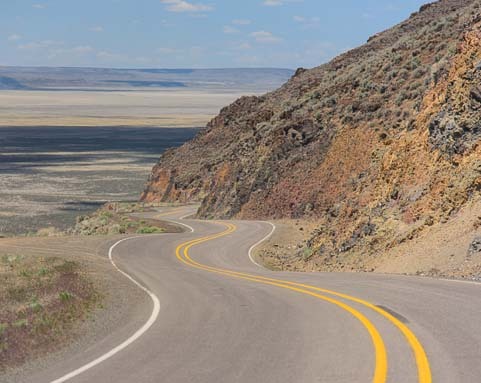 Instead, crossing the back side of Winnemucca to get onto our remote road to Oregon, all we saw were three small gas stations that looked very hard to get into. There would be other places to get gas at all those other towns we saw up ahead on the map, right? Wrong! “Next gas 179 miles” a sign said a few miles after we’d left Winnemucca. Well, we had enough to go that distance and quite a bit more, so we carried on. We knew we just might have to pay a little more than the $3.69 to $3.85 or so per gallon that we’d been paying lately. No big deal. The land we passed on this drive was vast and barren and utterly void of any evidence of humanity. For hours on end, we saw no houses, no buildings, and no intersecting roads. We saw nothing but the great wide open! 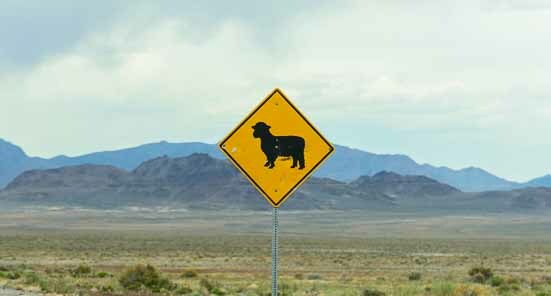 About the only distraction we had from the immense emptiness that lined the road was the occasional animal road sign. There weren’t any animals anywhere that we could see — there weren’t any signs of life at all! 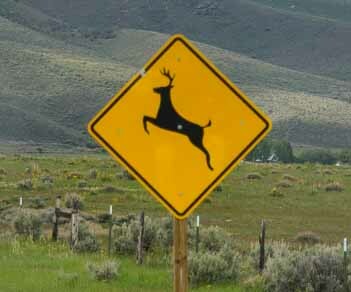 — but we saw road signs for deer and remembered the awesome deer herd sighting we’d had on the road back in Utah. A few days earlier we’d driven past this wonderful herd of deer in Utah! 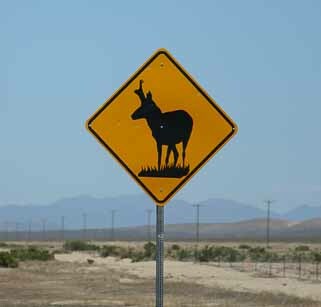 It’s funny — the sign painters must have known these animal road signs were destined for endless empty stretches of road. In other parts of the country, the cattle signs always show a cow grazing. Not here. 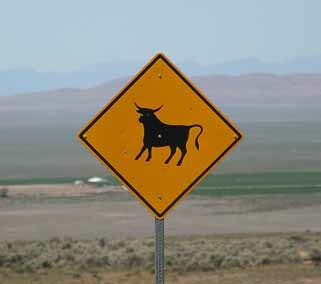 These cattle signs showed a startled bull that seemed quite surprised to see a car going by. 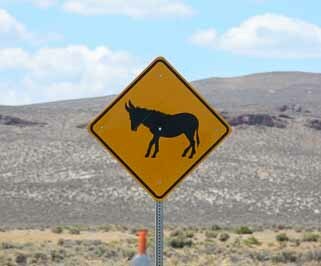 There were signs for pronghorn antelope and signs for burros. 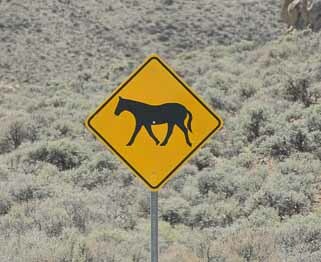 There were even signs warning that horses might trot across the road! At long last we spotted a gas station far in the distance ahead and it was a nice big one – easy in, easy out! But our jaws dropped when we saw the price of diesel: $4.29 a gallon. We stared at each other in disbelief. That was highway robbery! 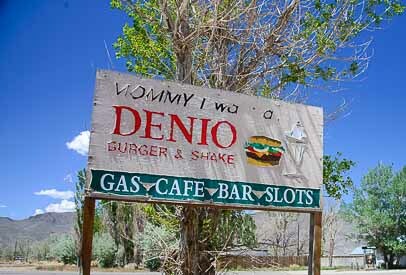 Denio Junction had it all — mostly. The scary part was that we weren’t going to travel those 81 miles. Our route was going to turn off and become even more remote for a few hundred miles more! Suddenly we had a big decision: take a 25 mile detour to an area that was likely to have a gas station, or take a gamble that we could make it another 300 miles or so without filling up. When we finally got to a Shell station after driving all those unnecessary extra miles and saw the diesel price was $4.39 a gallon, we didn’t even blink! It consisted of two gas pumps (that hadn’t worked for years) and a cute restaurant and bar — all in one building. 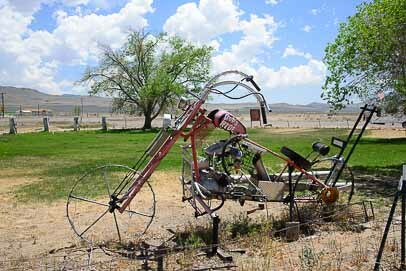 A pile of scrap metal in the yard had been turned into a motorcycle. “God’s Ride” was painted on the seat. We climbed back in the truck and watched another hundred miles of nothingness tick by. Then, off in the distance, we saw an animal sign we hadn’t seen before. I squinted hard to try and make it out. “Poodle crossing??! !” I said incredulously. Hang on tight for a wild ride! Oh my. I guess I was getting weary!! No wonder they don’t allow semis on this road! 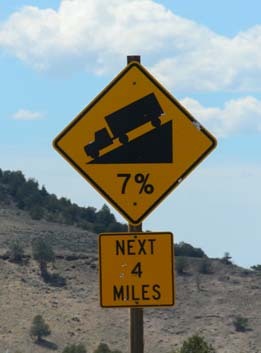 A few hours later we saw a sign that made us sit up and take notice: a four mile long 7% descent. 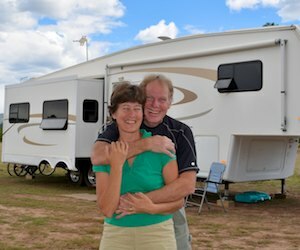 What a thrilling ride that turned out to be as 14,000 lbs of fifth wheel trailer pushed us down not just one 4 mile section of wild S-curves with a huge exposed drop-off on the side but several of them in a row! We plunged from a high plateau onto a wide valley floor. Diamond Lake has a nice paved bike path around it. “If you take that photo everyone will know I was driving on the wrong side of the road!” Mark laughed when I grabbed the camera to get a shot of the twists ahead of us. Yup! And thank goodness for the exhaust brake on the truck and the utter lack of cars on the road! 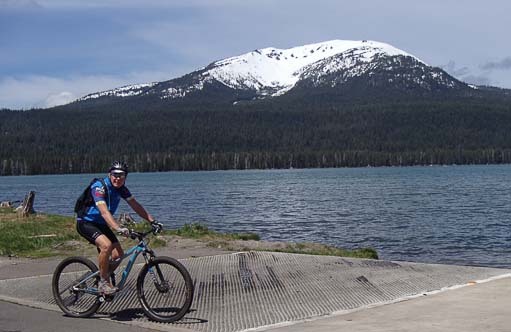 When we finally arrived in Oregon‘s beautiful ponderosa pine forests and settled down near pretty Diamond Lake, we laughed when we saw the price of diesel at the lake’s lone gas station: $5.29 a gallon. Luckily, this time we wouldn’t have to buy. Real civilization, with real towns, was just 50 miles further down the road. Ahhh…welcome to the pine forests of Oregon! 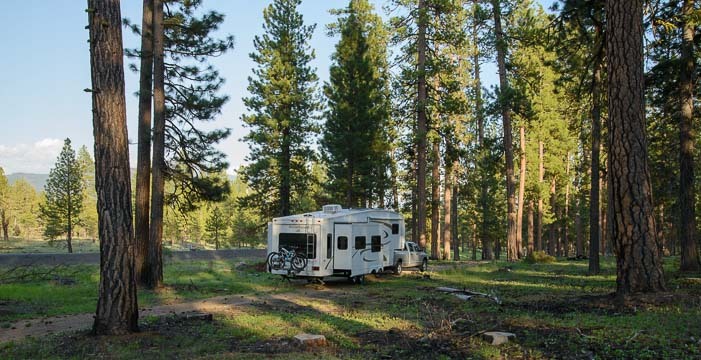 This entry was posted in Nevada and tagged Back Roads RV Trips, Nevada, New, Travel, USA, WP Travel by Roads Less Traveled. Bookmark the permalink.